Reach your goals -- at your own pace!!! An effectively-set goal hugely increases your potential for succeeding at anything you do, and allows you to proceed at a pace that’s focused, but relaxed. In the first chapter of this book, Blaine Smith—who writes with a heart for the issues and concerns we face as Christians—outlines ten steps for establishing a life-changing goal. In chapter two he looks at the stunning power of simple persistence, and how relaxed perseverance enables you to achieve dreams you thought impossible. In chapter three, he encourages you to stay optimistic and hopeful about achieving your important goals, and offers a critical principle for weighing open and closed doors. He also adds a chapter on overcoming the fear of change, for those who are hesitant to take on a goal or dream they dearly want to pursue. 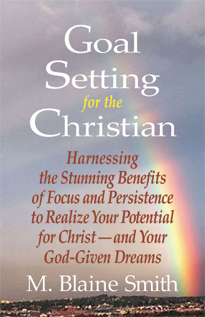 Goal Setting for the Christian is purposely a short book, designed to be an easy read, but to give you solid counsel that will get you up-and-running with your important goals. God has fashioned you uniquely, and given you unspeakable gifts and opportunities. Follow the counsel of this book, and achieve that “impossible” dream! (Chapter one of this book is excerpted from Blaine Smith’s Reach Beyond Your Grasp: Embracing Dreams That Reflect God’s Best for You—And Achieving Them. The appendix chapter and part of chapter three are adapted from Blaine ’s Faith and Optimism: Positive Expectation in the Christian Life (formerly The Optimism Factor). *This book was previously published in a Kindle edition titled, How to Set Goals That Vastly Increase Your Potential for Success—And Harness Natural Energy to Achieve Your Dreams. That edition is no longer available. M. Blaine Smith, a Presbyterian pastor, is author of ten books, including Knowing God’s Will, The Yes Anxiety, and Should I Get Married. He is director of Nehemiah Ministries in the Washington , D.C. area.